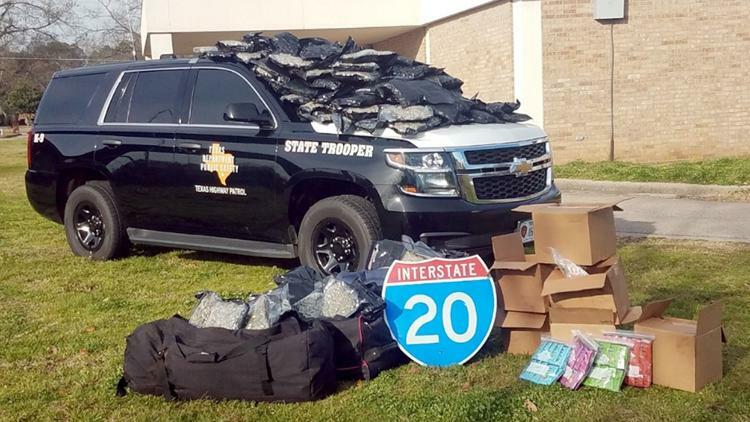 The Texas Department of Public Safety (DPS) seized more than 200 pounds of marijuana and over 80 pounds of marijuana edibles on January 20 after a traffic stop. At approximately 11:17 a.m., a DPS Highway Patrol Trooper stopped a GMC work truck on IH 20 approximately two miles north of Kilgore for a traffic violation. Due to several indications of possible criminal activity, a canine search of the vehicle was conducted. During the search, the Trooper discovered duffle bags containing marijuana, additional separate bags of marijuana and marijuana edibles concealed in the truck. The driver, Klaus Williams, 35, of Malabar Florida and the passenger, Marvin Wynter, 44, of Port St. Lucie Florida were arrested and charged with possession of marijuana more than 50 lbs. less than 2,000 lbs. Both were transported and booked into the Gregg County Jail. The drugs allegedly were being transported from the west coast to Florida.